Coupons and that kama’aina rate! Have you ever wondered how you can get a kama’aina rate? Wondering what a kama’aina rate is? It’s a discount some shops and restaurants will give to local customers, hoping they will be repeat customers. Generally you need to have a State of Hawaii driver’s license or other State of Hawaii ID to qualify for that local discount. By the way, did you know Hawaii driver’s licenses have a rainbow on them? I would show you a picture of mine, but…. well…. as with most IDs the picture turned out ‘just great’. 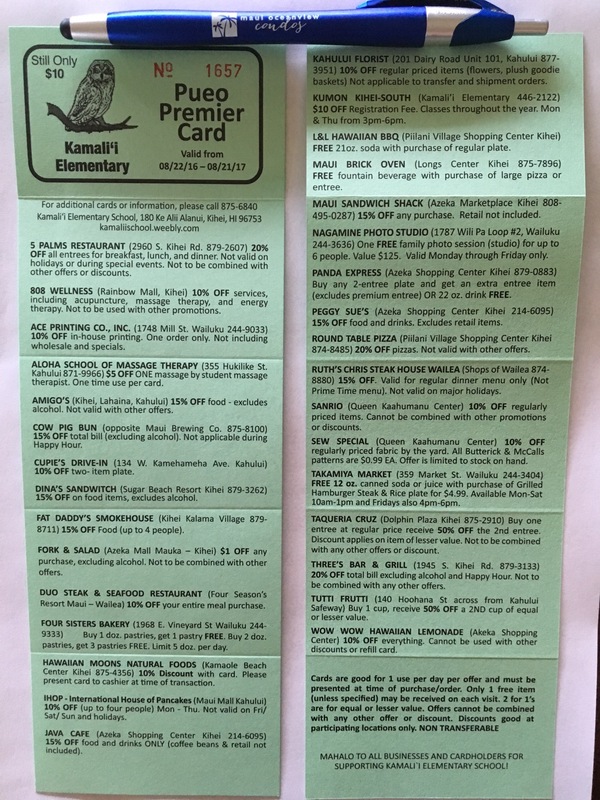 If you are staying at one of our four condos, we have the next best thing to a kama’aina rate: the Pueo Premier Card – a discount card for our guests to use! This is a fundraiser put on by one of the local elementary schools. No worries, you do not need to buy one – we always buy them and leave them in the condos for our guests to use. The discounts are similar to what some of these businesses offer as a kama’aina rate, and some of these businesses don’t actually offer a kama’aina rate, so this is as good as it gets! Where can you find this card? If you are staying at one of our condos, look for it in the condo (near the business cards, at our Palms at Wailea condo it’s next to the kitchen phone). You are welcome to use the card, please just remember to leave it in the condo when you leave so our next guests can take advantage too. If you are not staying at one of our condos, swing by Kamalii Elementary School on the corner of the Piilani Hwy and Alanui Ke Alii (just up the road from Kamaole I beach) in Kihei. They have them for sale in the school office (by the flag pole). Thanks for supporting the kids!